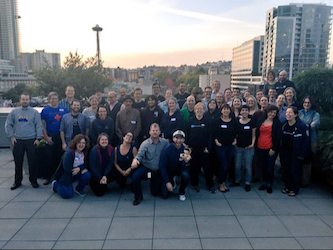 I’m writing this blog while flying home from Seattle, WA where, for the past two days, almost 60 community members came together in support of the Salesforce Foundation and the Nonprofit Starter Pack (NPSP). This was, in the years that I’ve been in the sector, a pivotal moment in a history filled with start-stops, questions, fears, hopes, and desire for change and illumination. At no other time have we witnessed so much active community enthusiasm, nonprofits stepping forward to own the NPSP, and implementation partners working together for the common good. I was literally moved to tears of joy. Megan (Co-Founder of BrightStep Partners) and I have been involved, in some capacity, with nonprofits using Salesforce for a very long while. Long enough to remember the predecessors to the Nonprofit Starter Pack, and witness many challenges and victories of nonprofits using Salesforce. We’ve both watched the Salesforce platform itself and the NPSP grow in leaps and bounds, and with this growth, an explosion of nonprofits who are becoming increasingly empowered to implement technology in a strategic and transformational manner, of which Salesforce is a core component. The path from then to now is very long, full of many twists and turns, and carried a lot of surprises for all of us as we all grew up together. I won’t bore you with the details, but suffice to say that being present for such a moment as we’ve just experienced was an incredible gift. I was honored to give a group blessing at the start of the Sprint, during which I reflected on the nature of magic: the creation of an energetic force as an individual or group through engaging in practice and ritual. It’s everywhere if we want to look for it, because so many things can be considered ritual and sacred, including coming together for the common good such as we did in Seattle. I wasn’t prepared for how incredibly magic the following two days were to be. Feeling awed by the number of people who turned out, all of whom came at their own expense, and the partners who sponsored the Sprint with a steady stream of coffee, food, and fun. Watching new consultants, who are just beginning their careers, jump right in and take responsibility for improving our community and tools in important ways. Seeing first hand the impact of Girlforce, and realizing that I was surrounded by women who were empowered technology leaders. Listening for how to best meet the community-enhancing and communication needs of the Nonprofit Starter Pack Advisory Board. Being honored with facilitating a “vision” track for thinking through giant “What if?” improvements to the NPSP, and seeing others take these on with joy to further plan out and create. Witnessing the depth of care that we have for making sure nonprofits feel genuinely held and supported with clear and organized documentation and resources. Connecting with others who share the value of how much we want nonprofits using Salesforce to be completely immersed in a community experience that helps them grow. Barely keeping up with the thoughtful and savvy coders and developers, many of whom were contributed directly by the Salesforce Foundation, who oversaw major improvements in the operation of the NPSP with finesse and foresight. Experiencing deep gratitude for partner organizations such as Kell Partners, who just contributed the entirety of their managed package for Partial Soft Credits and Matching Gifts to the NPSP and Salesforce Foundation to include in the NPSP. Hearing others come up with new ideas and improvements for the NPSP that wouldn’t have occurred to me in my wildest dreams. Bearing witness to the full birth of a community that has accepted the challenge and the mantle of empowering itself, with joy, hard work, and tenacity. I said at the close of the Sprint that the joy of being in spiritual service to others is that the blessings we offer are returned to us in ways that we don’t immediately see but frequently understand after they arrive. This time, my blessing came back almost immediately – feeling as if we’ve reached a moment of trust, friendship, leadership, support, and facilitation that is going to have repercussions for nonprofits everywhere and for a long time to come. I sincerely applaud the Salesforce Foundation for taking leadership in this way. Having trust that its community knows how to shape the destiny of nonprofits using Salesforce, giving of its staff, time and money towards these efforts, and finding a means to facilitate change. A core principle of justice, to me, is not defining the experience of others but allowing your own presence to elevate this experience and to be of genuine service to them in their journeys. To this end, the Seattle Sprint was one of the most important steps forward that I’ve ever witnessed, and I look forward to seeing how our community, our leaders, and our efforts grow. Thank you.